This Ain’t California at the 2012 Vancouver International Film Festival. This Ain’t California – No need to know anything about skateboarding to enjoy this fantastic film. This Ain’t California is a sharp, engaging documentary that looks at East Germany (and subsequently the fall of the Iron Curtain) by defining its relationship to skateboarding. The film focuses on a group of skateboarding friends brought back by the death of their ringleader to the town they grew up in. In the early 1980s, a group of three boys discover the joy of wheels and hills. They build boards out of old, curved plastic chairs, and roller skate wheels. They surprise each other with the bond they form over the sheer joy of skateboarding. Together again after a decade, their memories provide the narrative thread for the film. However, in the greyness of the GDR in the 1980s, what in private is just a game, on city streets gains political significance. 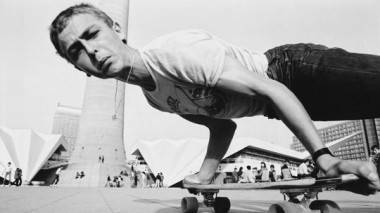 Skateboarding wasn’t about competition; it wasn’t about achieving a goal. Skateboarding existed for fun. Otherwise, it was completely pointless. Pointless and exciting. The GDR was simply not made that way. People were given opportunity to choose and excel at a sport. But doing things for fun didn’t exist; that wasn’t how the GDR worked. This Ain’t California shows how a lot of people didn’t know how to deal with skateboarders in the 1980s and 1990s. Visually, the film is alive. Newcomer director Marten Persiel got lucky. One of the boys in the film recorded a lot of the crew’s life on gorgeous, grainy film in the 1980s. As the VIFF program guide says, it’s not too much to say that This Ain’t California raises the bar for documentary film-making. Highly recommended, this doc might make you see concrete in a new way. Perhaps as a gigantic playground; corners, edges everywhere. Winner of the Dialogue en Perspective prize, Berlin 2012. VIFF has given This Ain’t California an extended run. Catch a screening on October 15th at 9:00pm at Vancity Theatre. Reality – Reality is the story of a man caught up in a fantasy world. Luciano is an ordinary man of no particular passions. He works as a fishmonger; he is a husband, father, and occasional clown. At a posh wedding one day, he encounters the winner of the latest season of Big Brother and, on jostling from his children, talks his way into auditioning for the reality television show. One successful audition leads to another, and Luciano becomes certain that now he has something that will change his life and make his remarkable. He is certain that he will be chosen for the show. Luciano’s faith in Big Brother (and, more broadly, fame and public recognition) as a way to make his unremarkable life better marks a turning point in the film. When the series begins without him, he remains sure that he will be picked nonetheless. He is glued to the television, waiting for his name to be called. He believes that everybody around him is part of the show and spying on him, vetting him as a candidate. He begins to give away personal possessions as ways of showing generosity. His wife despairs. Her husband has lost sense of reality. The key theme in the film is that despite all of the lengths to which Luciano goes to show his worth, all of his actions are intended for an audience. Thus his real life becomes confused, tangled up, like a reality television series. He stops existing without an audience. Despite a slow first half, this film is powerful, complicated, and disturbing. It offers insight into how modern life is lived increasingly in public. Social media profiles are carefully crafted and screened for favourable content, much like creating and playing a character in a reality television series. Reality offers a very forceful, at times violent, view into how modern life often favours glossy facades. Religious parables are explored in the movie as well. I left the theatre shaken. This is not a light movie to watch, but it does offer a very honest glimpse into modern life, which increasingly works to remove ourselves from ourselves. This entry was posted in Homepage Features, reviews and tagged movie reviews, Vancouver International Film Festival. Bookmark the permalink.